Friction stir processing (FSP), developed based on the basic principles of friction stir welding (FSW), a solid-state joining process originally developed for aluminum alloys, is an emerging metalworking technique that can provide localized modification and control of microstructures in near-surface layers of processed metallic components. The FSP causes intense plastic deformation, material mixing, and thermal exposure, resulting in significant microstructural refinement, densification, and homogeneity of the processed zone. The FSP technique has been successfully used for producing the fine-grained structure and surface composite, modifying the microstructure of materials, and synthesizing the composite and intermetallic compound in situ. In this review article, the current state of the understanding and development of FSP is addressed. Manuscript submitted August 16, 2007. Friction stir welding (FSW) is a new solid-state joining technique invented at The Welding Institute (TWI) (Cambridge, United Kingdom) in 1991. [1,2] The basic concept of FSW is remarkably simple. A nonconsumable rotating tool with a specially designed pin and shoulder is inserted into the abutting edges of plates, to be joined and then traversed along the line of joint when the shoulder touches the plates (Figure 1). The tool heats the workpieces and moves the material to produce the joint. The heating is achieved by the friction between the tool and workpieces and by the plastic deformation of the material. Localized heating softens the material around the pin and the combination of tool rotation and translation results in the movement of material from the front to the back of the pin. Thus, a welded joint is produced in solid state. Recently, a new processing technique, friction stir processing (FSP), was developed by Mishra et al.,[17,18] for microstructural modification based on the basic principles of FSW. In this case, a rotating tool with pin and shoulder is inserted in a single piece of material, for localized microstructural modification for specific property enhancement. For example, a fine-grained microstructure for high-strain-rate superplasticity was obtained in the commercial 7075Al alloy through FSP. [17,19] Furthermore, the FSP technique has been used for the fabrication of a surface composite on aluminum substrate, and the homogenization of powder metallurgy (PM) aluminum alloys, metal matrix composites, and cast aluminum alloys. [21, 22, 23] Compared to other metalworking techniques, FSP has distinct advantages. First, FSP is a short-route, solid-state processing technique with one-step processing that achieves microstructural refinement, densification, and homogeneity. Second, the microstructure and mechanical properties of the processed zone can be accurately controlled by optimizing the tool design, FSP parameters, and active cooling/heating. Third, the depth of the processed zone can be optionally adjusted by changing the length of the tool pin, with the depth being between several hundred micrometers and tens of millimeters; it is difficult to achieve an optionally adjusted processed depth using other metalworking techniques. Fourth, FSP is a versatile technique with a comprehensive function for the fabrication, processing, and synthesis of materials. Fifth, the heat input during FSP comes from friction and plastic deformation, which means FSP is a green and energy-efficient technique without deleterious gas, eradiation, and noise. Sixth, FSP does not change the shape and size of the processed components. The FSP technique is emerging as a very effective solid-state processing technique that can provide localized modification and control of microstructures in the near-surface layers of processed metallic components. In the relatively short duration after its invention, increasing applications are being found for FSP in the fabrication, processing, and synthesis of metallic materials. [17, 18, 19, 20, 21, 22, 23, 24, 25, 26, 27, 28, 29, 30, 31, 32, 33, 34, 35] In this article, the current state of understanding and development of FSP are reviewed. The use of FSP generates significant frictional heating and intense plastic deformation, thereby resulting in the occurrence of dynamic recrystallization in the stirred zone (SZ). In this case, fine and equiaxed recrystallized grains of quite uniform size were produced in the SZ. Figure 2 shows a typical microstructure of FSP 7075Al-T651. A fine-grained microstructure of ∼7.5 μm was produced at a tool rotation rate of 400 rpm and a traverse speed of 102 mm/min. Although there is still a controversy about the grain-refinement mechanism in the SZ, it is generally believed that the grain refinement is due to dynamic recrystallization. [2, 3, 4,36, 37, 38, 39] Therefore, the factors influencing the nucleation and growth of the dynamic recrystallization will determine the resultant grain microstructure in the SZ. It has been demonstrated that the FSP parameters, tool geometry, material chemistry, workpiece temperature, vertical pressure, and active cooling exert a significant effect on the size of the recrystallized grains in the SZ. 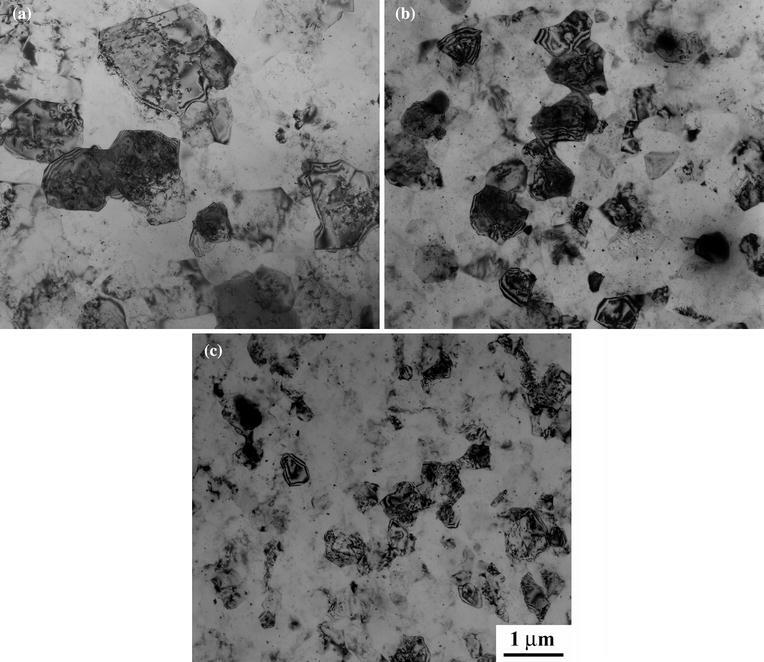 Figure 3 shows transmission electron microscopy (TEM) micrographs of FSP Al-4Mg-1Zr samples under different FSP conditions. It is noted that the grain size of FSP samples can be tailor made by adjusting the FSP parameters and tool geometries; as a result, the ultra-fine-grained microstructure of 0.4 to 0.7 μm was obtained. In the SZ of FSW/FSP aluminum samples, the micrometric grains were usually observed. However, recrystallized grains 25 to 100 nm in size obtained in FSP 7075Al-T651 by using the “plunge and extract” technique and rapid cooling indicated that the observed micrometric grains in the SZ appeared because of the growth of the nanosized recrystallized grains. Therefore, it is likely to achieve the nanostructured aluminum alloys via FSP with active cooling. Su et al. reported the generation of 100-nm recrystallized grains in FSP 7075Al-T651 by means of rapid cooling behind the tool, using a mixture of water, methanol, and dry ice (Figure 4). By overlapping the processing passes, bulk ultra-fine-grained aluminum alloy could be produced via FSP, as shown in Figure 5. In the past few years, various processing techniques such as thermomechanical treatment (TMT),[55,56] equal channel angular pressing (ECAP),[57,58] torsion under compression, multiaxial alternative forging (MAF), and accumulative roll bonding (ARB) have been used to produce the fine-grained materials for superplasticity. The advantages of the FSP technique compared to these other processing techniques are summarized. First, FSP is a relatively simple processing technique with a one-step processing that produces a fine-grained microstructure. Other processing techniques are relatively complex and time-consuming and lead to increased material cost. For example, TMT involves solution treatment, overaging, multiple-pass warm rolling with intermittent reheating, and a recrystallization treatment. For ECAP, at least 4 to 6 passes are required to achieve microstructural refinement. [57,58] Second, FSP does not reduce the thickness of the processed plates; therefore, it is possible to achieve the superplastic forming of thick plates. [62,63] Depending on the length of the tool pin, the fine-grained microstructure can be achieved in the plates with a thickness of up to tens of millimeters via FSP. In unpublished research, Mahoney et al. have illustrated uniform elongations (El.) up to 500 pct in a 12-mm-thick 7475Al plate prepared via FSP. For TMT, a large rolling reduction, required for obtaining the fine-grained microstructure, produces the superplastic plates having a thickness of less than 3 mm, typically. Third, a local processing can be achieved via FSP. In this case, it is possible to produce a local fine-grained microstructure in a region that will undergo superplastic deformation. A concept of selective superplastic forming has been suggested and demonstrated by means of FSP. By comparison, other techniques cannot produce microstructural refinement on a selective basis. Fourth, the fine and equiaxed grains with high ratio of high-angle boundaries in FSP aluminum alloys resulted in the generation of high-strain-rate superplasticity and low-temperature superplasticity, as shown in Table I. The use of the FSP technique results in the intense plastic deformation and mixing of material in the processed zone; the true strain during FSP was estimated to be as high as 40. In this case, it is possible to incorporate the ceramic particles into the metallic substrate plate, to form the surface composites. Mishra et al. reported the first result on the fabrication of a SiCp-Al surface composite via FSP. The SiC powder was added into a small amount of methanol and mixed, and was then applied to the surface of the plates, to form a uniform thin SiC particle layer. The aluminum plates with a preplaced SiC particle layer were subjected to FSP. With the optimized tool design and processing parameters, a composite layer of ∼100 μm, with well-distributed particles and a good bonding with the aluminum substrate, was generated on the substrates of 5083Al and A356 aluminum alloys (Figure 9). By adjusting the FSP parameters, 5 to 27 vol pct of the SiC particles could be incorporated into the aluminum matrix. The HV of the surface layer of aluminum substrates was significantly enhanced with the incorporation of SiC particles, and increased as the SiC particle volume fraction was increased for the FSP SiCp/5083Al surface composite (Figure 10). Similarly, incorporating 15 vol pct SiC into the surface layer of A356 via FSP increased the HV from 98 to 171. With deeper grooves being cut, Lee et al. demonstrated a successful fabrication of bulk composites via FSP. [24,67,68] In their studies, one or two grooves 6 mm in depth and 1.25 mm in width was cut on the AZ61 plate, in which nanosized SiO2 or ZrO2 were filled to the desired amount. A multiple-pass FSP was conducted along the length direction of the grooves, thereby creating a uniform bulk composite with a certain number of particle clusters of 0.5 to 3 μm (Figure 11). The bulk composites fabricated via FSP showed enhanced hardness and strengths (Table II). Furthermore, a high-strain-rate superplasticity of >400 pct was obtained in a AZ61 composite reinforced by nanosized SiO2 particles at high rates of 1 × 10−2 to 3 × 10−1 s−1. More recently, Dixit et al. successfully dispersed and embedded nitinol particles in 1100Al matrix via FSP. They used four small holes 1.6 mm in diameter and 76 mm in length, and drilled ∼0.9 mm below the surface of the 1100Al plate to load the NiTi powders. Subjecting the powder-filled plate to FSP produced a uniform NiTi/1100Al composite with directional residual stresses and improved mechanical properties. During FSP, the rotating pin with a threaded design produces an intense breaking and mixing effect in the processed zone, thereby creating a fine, uniform, and densified structure. Therefore, FSP can be developed as a generic tool for modifying the microstructure of heterogeneous metallic materials such as cast alloys, metal matrix composites, and nanophase aluminum alloys prepared through the PM technique. Alloys of Al-Si-Mg (Cu) are widely used to cast high-strength components in the aerospace and automobile industries, because they have good castability and can be strengthened by artificial aging. The as-cast structure of Al-Si-Mg (Cu) alloys is characterized by porosity, coarse acicular Si particles, and coarse primary aluminum dendrites (Figures 12(a) and 13(a)). These microstructural features limit the mechanical properties of cast alloys, in particular, toughness and fatigue resistance. [71,72] Eutectic modifiers and high-temperature heat treatment are widely used to refine the microstructure of cast Al-Si alloys, to enhance the mechanical properties of the castings. [73, 74, 75] However, none of these approaches can heal the casting porosity effectively and redistribute the Si particles uniformly into the aluminum matrix. Ma et al. [23,29] conducted FSP on sand-cast A356 plates under wide FSP parameters. Their results indicated that FSP resulted in the significant breakup of coarse acicular Si particles and coarse primary aluminum dendrites, the closure of casting porosities, and the uniform distribution of broken Si particles in the aluminum matrix (Figure 12(b)). Increasing the rotation rate and number of FSP passes resulted in a decrease in the size and aspect ratio of the Si particles and the porosity level, due to the intensified stirring effect (Table III). Similarly, Santella et al. showed that FSP destroyed the coarse and heterogeneous cast structure of A319 and A356 sand castings and created a uniform distribution of broken second-phase particles (Figure 13(b)). The TEM observations revealed the generation of a fine-grained structure of 5 to 8 μm in FSP A356 and 2 to 3 μm in FSP ADC12. Figure 14 shows the fine-grained structure in the FSP ADC12 alloy. The grain size in the FSP samples is much smaller than that in the as-cast structures, indicating the occurrence of dynamic recrystallization during FSP. The SZ with the refined grains has been widely observed in FSP/FSW wrought aluminum alloys, as summarized in a recent review article. Furthermore, TEM examinations revealed that the coarse Mg2Si precipitates in the as-cast A356 sample disappeared after FSP, indicating the dissolution of most of the Mg2Si precipitates during FSP. The accelerated dissolution of the Mg2Si precipitates during a short period of the FSW cycle was attributed to significantly accelerated diffusion rates and shortened diffusion distances of the solutes resulting from intense plastic deformation and material mixing. After FSP, most of the solutes were retained in solution, due to rapid cooling from the FSP temperature, thereby forming a supersaturated aluminum solid solution. Tables IV and V show the tensile properties of single-pass FSP A356 by using minitension specimens, and of multipass FSP A319, A356, and ADC12 by using full-sized specimens. An improvement in the tensile properties of Al-Si alloys—in particular, in the ductility—is achieved by FSP. Further, the fatigue resistance of the Al-Si alloys was enhanced by FSP. [29,76] The improvement in the mechanical properties of FSP Al-Si alloys is attributed to the following factors. First, the breakup of coarse acicular Si particles reduced the Si particle cracking under low stress and, consequently, minimized the possibility of the void initiation associated with damaged Si particles, thereby improving the ductility and increasing the strength. Furthermore, the ultra-fine Si particles produced by FSP exerted additional strengthening effects on the aluminum matrix through dislocation/particle interaction. Second, the fundamental elimination of porosity reduced the possibility of void initiation at such porosities, thereby improving the strength and ductility of Al-Si alloys. Third, the microstructural refinement of the aluminum matrix produced by FSP (Figure 14) increased the strength of the FSP samples through Hall–Petch strengthening. Fourth, the room-temperature natural aging of the supersaturated aluminum solid solution produced by FSP resulted in an increase in the strength of the FSP samples. Increasing the tool rotation rate from 300 to 900 rpm resulted in increased strength in the FSP A356 samples (Table IV). This is attributed to a decrease in the porosity level and the Si particle size and an increase in natural aging-strengthening resulting from additional dissolution of the Mg2Si precipitates at a higher tool rotation rate. Two-pass FSP with 100 pct overlap resulted in an increase in strength and a decrease in ductility. These property changes are attributed to a further decrease in the porosity level and Si particle size and an increase in the natural aging-strengthening resulting from the additional dissolution of the Mg2Si precipitates produced by two-pass FSP. A post-FSP artificial aging resulted in a further increase in strength and a reduction in ductility, due to the precipitation of more solutes. For higher rotation rates or two-pass FSP, the artificial aging-strengthening effect was significantly enhanced, due to the dissolution of more precipitates during FSP. Aged two-pass FSP samples exhibited a very high strength with a good ductility, comparable to the T6-treatment properties. This indicates that maximum strengths can be achieved in post-FSP aged A356 samples by controlling the FSP parameters, and that achieving these strengths does not require a separate T6 solution treatment. Alloys of Mg-Al-Zn with a higher aluminum content were widely used as diecast or wrought alloys such as AZ91 and AZ80. Heat-resistant magnesium alloys with thermally stable second-phase particles such as Al2Ca, Mg3Zn6Y, Mg3Zn3Y2, Mg14Nd2Y, and Mg5(Gd,Y) can be used at higher temperatures. The as-cast alloys are characterized by coarse α-Mg dendrites and coarse heterogeneously distributed second-phase particles, such as a networklike β-Mg17Al12 phase in AZ91, along the grain boundaries, and therefore exhibit poor mechanical properties. It is necessary to modify the morphology and the distribution of the coarse second-phase particles in order to enhance the mechanical properties of the castings. Conventionally, a solution treatment at a higher temperature for a long time is required to dissolve the second-phase particles into the magnesium matrix, and then an aging is conducted to generate the fine precipitates. For example, a solution treatment at ∼415 °C for up to 40 hours was used to dissolve the eutectic β-Mg17Al12 network in the Mg-Al-Zn alloys. However, such a procedure is time consuming, resulting in not only increased material cost but also surface oxidation and grain coarsening. Alternately, the plastic-deformation route was used. It was reported that the multipass ECAP of AZ91, homogenized at 413 °C for 18 to 19 hours, resulted in both significant grain refinement and a change in the β-Mg17Al12 morphology from a long rod-like shape to smaller particles. However, at least 4 to 6 passes of ECAP were required to achieve microstructural refinement and homogenization. Use of the FSP technique resulted in the significant breakup/dissolution of the coarse second-phase particles and grain refinement. [80, 81, 82, 83] While the coarse eutectic β-Mg17Al12 network in cast AZ91 was mostly dissolved into the magnesium matrix during FSP (Figure 15), the Al2Ca network in thixomolded Mg-6Al-3Ca-0.5Re-0.2Mn was broken into the fine Al2Ca particles with a size of 20 to 100 nm (Figure 16). For the heat-resistant magnesium alloys, a very fine grain of ∼1 μm was produced, because the fine, thermally stable particles can prevent grain growth during the FSP thermal cycle; for the AZ91 alloy, however, a relatively large recrystallized grain of ∼15 μm was obtained, due to the absence of the pinning particles (Table VI). The dissolution of the β-Mg17Al12 phase in the FSP AZ91 samples was verified by energy-dispersive spectroscopy (EDS) and differential scanning calorimetry (DSC) analyses. For Mg-Al alloys, it takes up to ∼40 hours at ∼415 °C to achieve the complete dissolution of the β-Mg17Al12 phase, due to the low diffusion rate of aluminum in magnesium matrix. The duration for the conventional thermal cycle is much longer than that associated with the FSP thermal cycle. However, for FSW/FSP, severe plastic deformation in the nugget zone, with a strain rate of 100 to 103 s−1[44,85, 86, 87] and a strain of up to ∼40, facilitates the dissolution of β-Mg17Al12 phase, due to the significantly accelerated diffusion rate and shortened diffusion distance. For the FSP AZ91 sample with a high supersaturation of aluminum resulting from FSP thermal cycles, the post-FSP aging produced extensive continuous precipitation within the grains. The continuous or discontinuous precipitation was previously observed in the AZ91 supersaturated solid solution aged at 168 °C for 16 to 24 hours. Table VI shows the variation in the HV of the cast magnesium alloys before and after FSP. For the AZ91 alloy, the hardness of the as-FSP sample is only slightly higher than that of the base metal. This is attributed to two competitive factors influencing the hardness. While the breakup and dissolution of the eutectic β-Mg17Al12 phase tend to decrease the hardness of the AZ91D sample, the significant grain refinement increases the hardness of the sample. Thus, the as-FSP sample exhibited a hardness level equivalent to that of the base metal. 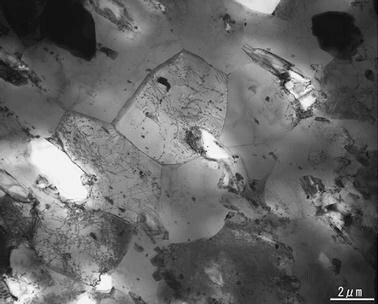 After aging at 168 °C for 16 hours, the hardness of the nugget zone increased considerably, due to the extensive precipitation of fine β-Mg17Al12 particles. For heat-resistant magnesium alloys, the hardness of the FSP samples is much higher than that of the base metals, due to the refinement of both grains and particles. The room-temperature tensile properties of the cast and FSP AZ91D samples are summarized in Figure 17. The as-cast AZ91D sample exhibited lower YS, ultimate tensile strengths (UTS), and lower El., due to the presence of the coarse β-Mg17Al12 network at the grain boundaries, which tends to crack or debond from the magnesium matrix early, under lower stress during tensile deformation. By comparison, the FSP sample exhibited significantly enhanced tensile properties, with the sample exhibiting a typical ductile dimple-fracture, because of the significant breakup and dissolution of the β-Mg17Al12 phase and remarkable grain refinement. First, the significant breakup and dissolution of the coarse β-Mg17Al12 phase reduced the possibility of the cracking and debonding of the β-Mg17Al12 phase under lower stress, thereby considerably improving the ductility and strength of the FSP sample. Second, the remarkable grain refinement increases the YS of the AZ91D alloy significantly, because of Hall–Petch slopes, k, that are larger in the magnesium alloy than in the aluminum alloy. Third, the solid-solution strengthening resulting from the supersaturated aluminum also contributed to the improvement in the strength of the FSP sample. While aging did not improve the tensile properties of the cast sample, the aged FSP sample exhibited much enhanced YS, UTS, and reduced El., due to the extensive continuous precipitation of fine β-Mg17Al12 particles. Cast nickel-aluminum bronzes (NAB) are widely used for marine components, due to their combination of corrosion resistance, strength, fracture toughness, friction coefficients, and nonsparking behavior. For cast thick-section NAB components, slow cooling rates result in the generation of coarse microstructures with surface and subsurface defects, thereby reducing the physical and mechanical properties. The static strength of thick as-cast sections usually drops well below the minimum specification values. Furthermore, in such applications, the NAB components are usually not heat treatable. In this case, FSP represents an alternative means of selectively strengthening the surfaces of such components. In the past few years, several investigations have been conducted to evaluate the effect of FSP on the microstructural involution and mechanical properties of the cast NAB. [91, 92, 93, 94, 95, 96, 97] It was indicated that FSP resulted in significant microstructural homogenization and refinements in the as-cast NAB and converted the microstructures from a cast to a wrought condition, as shown in Figure 18. [91, 92, 93, 94, 95, 96, 97] This type of microstructural evolution in the FSP NiAl bronze significantly improved the tensile properties and fatigue strength. [91,97] Furthermore, for multipass FSP covering large surface areas, it was indicated that rastering procedures produced an obvious effect on the mechanical properties of the FSP NiAl bronze—in particular, on ductility. Table VII shows the tensile properties of the multipass FSP NiAl bronze with linear and rectangular spiral rastering patterns. Clearly, FSP resulted in a 140 to 172 pct increase in YS and a 40 to 57 pct increase in tensile strength, irrespective of FSP rastering patterns. However, it was noted that, while the rectangular spiral raster resulted in an improvement in tensile El., the linear raster obviously reduced the ductility of the NiAl bronze. This was attributed to the uplifted grains with columnar morphology in the FSP NiAl bronze with the linear raster pattern, which cause strain localization. There is an increasing interest in the applications of the near-net-shape structural castings of titanium alloys in the aerospace industries. The replacement of mechanically fastened assembled parts by large, complex, one-piece castings reduces the structural weight and improves fatigue life, due to the elimination of fasteners and fastener holes. However, the coarse as-cast or as-cast and hot isostatically pressed (HIP) components do not have the fatigue crack initiation resistance that can be realized in wrought products. It is expected that the fatigue life of titanium castings can be improved by converting the as-cast microstructure to a fine-grained wrought microstructure through FSP. Figure 19 shows the effect of FSP on the microstructure of a HIP investment-cast Ti-6Al-4V sample. The HIP sample consisted of 1.5-mm prior β grains delineated by grain-boundary α and containing a coarse lamellar α + β colony structure (Figure 19(a)), a typical microstructure obtained with slow cooling from above the β transus. This indicates that the HIP cycle did not change the as-cast structure. By comparison, the microstructure of the FSP Ti-6Al-4V samples was characterized by equiaxed α grains 1 to 2 μm in size with a fine lamellar structure between some of the primary α grains that formed through the decomposition of the β phase after rapid cooling from the maximum temperature (Figure 19(b)). The microstructural refinement of Ti-6Al-4V resulted in increased YS, crack initiation resistance, and fatigue life. [100,101] It was reported that the FSP samples in the α/β and β FSP conditions had fatigue lives over an order of magnitude longer than the as-cast sample. Furthermore, the tensile ductility and stress corrosion resistance of the FSP samples were enhanced, due to the elimination of grain-boundary α of the as-cast microstructure. The improvement in the properties of the FSP Ti-6Al-4V samples is attributed to the decrease in the effective slip length, due to significant microstructural refinement by FSP, as shown in Figure 19. It is well established that slip length has a predominant effect on the mechanical properties of Ti-6Al-4V. 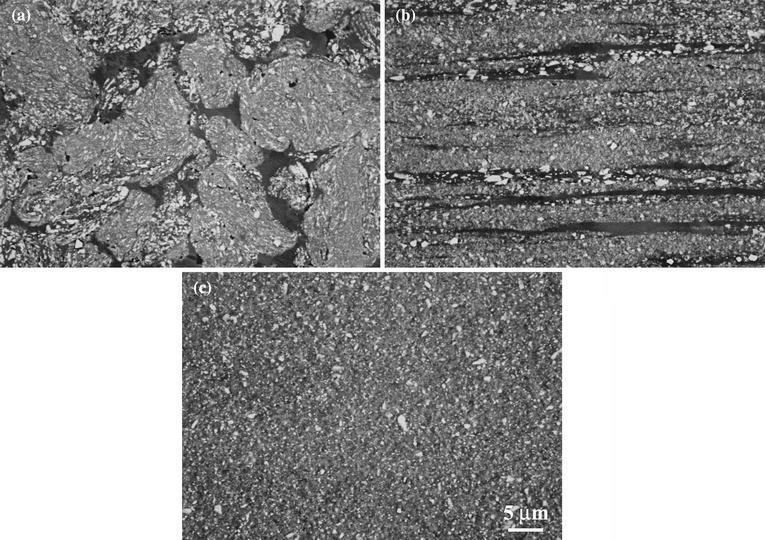 Figure 20 shows SEM micrographs of PM Al-10 pct Ti-2 pct Cu nanophase aluminum alloys under as-HIP, as-extruded, and as-FSP conditions. The as-HIP structure is quite heterogeneous and is characterized by nonbroken, cryomilled powders and aluminum-rich regions in between (Figure 20(a)). After the extrusion, both the cryomilled powders and the aluminum-rich regions were elongated along the extrusion direction, and the microstructure was still heterogeneous, with coarse Al3Ti particles being aligned along the extrusion direction (Figure 20(b)). By comparison, FSP created quite a uniform microstructure, in which the cryomilled-powder boundaries and aluminum-rich regions were completely eliminated and fine Al3Ti particles were uniformly distributed into the aluminum matrix (Figure 20(c)). It is expected that this type of uniform structure will exhibit enhanced mechanical properties. Tensile tests indicate that the as-HIP Al-10 pct Ti-2 pct Cu nanophase aluminum alloy exhibited very low tensile strength without ductility (Table VIII). After the extrusion, both the UTS and YS of the alloy increased significantly, but the ductility was still very low. After FSP, a significantly enhanced ductility was achieved, with the UTS and YS being slightly reduced. Clearly, FSP is a very effective approach to improving the mechanical properties of PM nanophase aluminum alloys. Figure 21 shows optical micrographs of as-extruded and FSP 25 vol pct SiCp/6061Al composites. The composite was prepared via the PM route, with Al and SiC particle sizes of 108.6 and 13.4 μm, respectively, followed by a subsequent extrusion at an extrusion ratio of 25:1. For the as-extruded composite, the SiC particles tended to align along the extrusion direction, the particle distribution was quite heterogeneous, and the SiC cluster was distinctly visible (Figure 21(a)). This indicates that the extrusion did not produce a uniform distribution of the SiC particles when a large initial Al/SiC particle size ratio of 8.1 was adopted. This is attributed to the insufficient and directional deformation of the extrusion process. After FSP, the distribution uniformity of the SiC particles improved significantly, due to the intense plastic deformation and material mixing, and the SiC particles exhibited a relatively random distribution without preferential orientation (Figure 21(b)). The substantially improved distribution uniformity of the SiC particles increases the strength and ductility of the FSP composite significantly (Table VIII). For a fixed matrix powder size, when very small reinforcements are used, it is difficult to fabricate the composites with uniformly distributed particles using the current PM technique. The FSP technique, with effective mixing and dispersion ability, could potentially enable the fabrication of the composites with uniformly distributed fine reinforcing particles. As discussed earlier, FSP produces thermal exposure and intense plastic deformation with a strain rate of 100 to 103 s−1[44,85, 86, 87] and a strain of up to ∼40, resulting in the significant breakup of coarse secondary phase and material mixing, and the accelerated diffusion of elements. Biallas et al. have suggested that the material flow around the pin during FSW is somewhat similar to that of regular milling of the metal. Mechanical alloying, consisting of the repeated deformation (welding, fracturing, and rewelding) of powder particles, has been widely used as a means of synthesizing nanostructured material. Therefore, it is likely to achieve in-situ reaction between elements via FSP. Hsu et al. reported the first result on the fabrication of in-situ ultra-fine-grained Al-Al2Cu composite. For the Al-Cu sintered billet, a lower sintering temperature of 500 °C for 20 minutes could not achieve the reaction between aluminum and copper. Increasing the sintering temperature to 530 °C enhanced the reaction significantly. 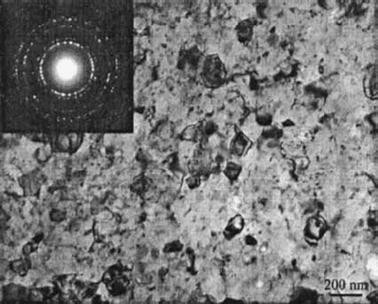 However, the initial coarse Cu or resultant Al2Cu particles were heterogeneously distributed in the aluminum matrix (Figure 22(a)). This indicates that, even though even the reaction between aluminum and copper can be thoroughly completed under higher sintering temperatures for a longer time, the resultant Al2Cu particles are coarse and heterogeneously distributed. 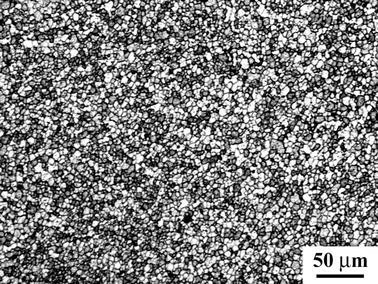 A two-pass FSP on the billets sintered at both 500 °C and 530 °C resulted in a thorough Al-Cu reaction and a uniform distribution of the resultant Al2Cu particles in the aluminum matrix, creating an ultra-fine-grained Al-Al2Cu composite (Figure 22(b)). This ultra-fine-grained Al-Al2Cu composite exhibited higher hardness and compressive strength. Recently, Hsu et al. investigated the effect of FSP on the in-situ reaction between aluminum and titanium in an Al-Ti sintered billet. It was indicated that even at a higher sintering temperature of 610 °C, only a small amount of Al-Ti reaction occurred around the Ti particles (Figure 23(a)). The FSP accelerated the in-situ reaction significantly. After a four-pass FSP, the Al-Ti reaction completed fundamentally, and nanosized Al3Ti particles formed in situ were uniformly dispersed in the ultra-fine-grained aluminum matrix, as shown in Figure 23(b). Tensile tests indicate that the Al-Al3Ti composites prepared by FSP exhibit high strength and modulus (Table IX). With an increase in the Ti content, both the strength and modulus increase, but the ductility decreases. The composite of Al-10 at. pct Ti exhibits a combination of high strength/modulus and good ductility. Chuang et al. 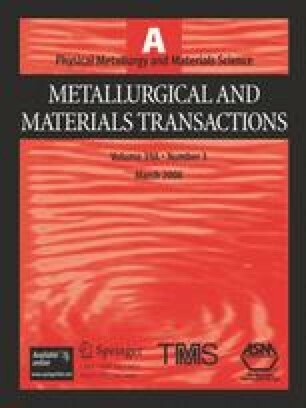 reported the first result on the fabrication of multi-elemental Mg-Al-Zn intermetallic alloys via FSP. In their study, with the desired portions of Mg, Al, and Zn, the thin foils of AZ31, Al, and Zn. with a thickness of 1, 0.2, and 0.125 mm, respectively, were stacked like a sandwich and held vertically, as shown in Figure 24(a). Multipass FSP was conducted with or without liquid N2 cooling, at a tool rotation rate of 1500 rpm and a traverse speed of 20 mm/min. It was revealed that FSP resulted in the generation of a Mg3Al2Zn3 phase and significant grain refinement (Figure 24(b)). Furthermore, some other nanosized ternary or binary phases were also detected. Figure 25 shows the hardness profiles along the cross sections of FSP samples with various ratios of Mg, Al, and Zn. Clearly, the formation of Mg3Al2Zn3 phase and other phases increased the hardness of the material significantly. The hardness of the FSP samples increased with the increase in the volume fraction of the Mg3Al2Zn3 phase. For the Mg37.5Al25Zn37.5 system, the maximum hardness approaches nearly 400 Hv. Intense plastic deformation and thermal exposure during FSP causes the breakup of coarse dendrites and second-phase particles, the refinement of matrix grains, the closure of porosity, and the dissolution of precipitates, thereby creating a fine, uniform, and pore-free wrought structure. The successful applications of FSP in producing the fine-grained structure and surface composite, modifying the microstructure of nonhomogeneous materials, and synthesizing in-situ the composite/intermetallic compound have demonstrated that FSP is energy efficient, environment friendly, and versatile, and can be developed to be a generic metalworking technique that can provide the localized modification and control of microstructures in the near-surface layers of processed metallic components. With further research efforts and an increased understanding of the FSP process, an increasing number of applications will be found for FSP in the fabrication, processing, and synthesis of metallic materials. Although a number of challenges still exist, FSP offers very attractive possibilities for commercial success. The author gratefully acknowledges the support of the National Outstanding Young Scientist Foundation under Grant No. 50525103, the National Basic Research Program of China under Grant No. 2006CB605205, the National High-Tech Research Program of China under Grant No. 2006AA03Z111, and the Hundred Talents Program of the Chinese Academy of Sciences.